On Friday, 31 March 1854, a large company of emigrating Latter-day Saints was allowed to board the American ship Marshfield, lying at anchor in Liverpool. They had expected to sail almost two weeks earlier, but the difficulty in securing ships for the Mormon emigration had postponed several hoped-for sailing dates. The fact that Jane was a black woman seems not to have been any handicap as far as her Church membership was concerned: She worshiped with the London Saints; she traveled with them to Liverpool; the PEF was open to her; she boarded the Marshfield with hundreds of other Saints on that Friday in March, 1854. Jane had plenty of time to arrange her berth aboard ship and to listen to the instructions of Elder William Taylor, the returning missionary who served as the company’s president, organizing the passengers into shipboard wards and assigning them their tasks for cooking and otherwise ordering themselves for the ocean passage. On Tuesday, 4 April, the Marshfield was finally hauled out of her dock and into the River Mersey. On Wednesday, 5 April, the ship’s doctor examined all passengers. He was looking for signs of illness that could result in disastrous contagion in the close quarters of a ship during the crossing. It has been suggested that this fear was simply an excuse to avoid carrying a black woman among the ship’s company. There seems to be no basis for this speculation: Jane’s race had proven no barrier to her participation in the Church and her travel to Liverpool with the rest of the Saints. The year before, a Mormon company aboard the International, sailing from Liverpool to New Orleans, had conducted 48 baptisms in a large vat on the ship’s deck – three of those baptisms had been of black crew members, with no recorded murmuring by any white member aboard. English Latter-day Saints seemingly did not bear the racial animosity of some American Latter-day Saints. So Jane sailed from Liverpool, heading toward a country where she knew no one, without the leadership of a returning elder who understood ships and trains and wagon companies, aboard a ship with no other Latter-day Saints. When she reached Quebec, she was on her own to support herself, without family, without friends, until she could continue her travels. She was on her own to find her way west, or to reconnect with the Saints on the frontier. The next phase of research into her life will be to search for some trace of her presence in Canada. There is no indication that Jane Hunter ever reached Utah, or that she was ever again in contact with the Church. Church of Jesus Christ of Latter-day Saints. European Mission. Emigration Record. CR 271 25, vol. 2, folios 71, 82, 86. “Emigration Report,” Millennial Star, 13 May 1854, 297. England. 1841 census. Middlesex, Tower Hamlets, Shoreditch. England. 1851 census. Middlesex, St. Pancras, Camden Town. Fisher, Thomas F. Journal, entries for 31 March - 5 April 1854. MS 12,594, Church of Jesus Christ of Latter-day Saints, Church History Library, Salt Lake City, Utah. Campey, Lucille H., Seeking a Better Future: The English Pioneers of Ontario and Quebec . Toronto: Dundurn, 2012. Lamoreaux, A.L., Letter to Samuel W. Richards, dated 8 April 1854. “The French Emigration,” Millennial Star, 29 April 1854, 270-271. “Over the Waves: SS Anglo Saxon,” Original Shipster [blog], 29 November 2015. “Emigration,” Millennial Star, 26 November 1853. “The Perpetual Emigrating Fund,” Millennial Star, 26 November 1853. 1 “Emigration,” Millennial Star, 26 November 1853, 776-777. Church of Jesus Christ of Latter-day Saints. European Mission. Emigration Record. CR 271/25, vol. 2, folios 67, 82, 86. 2 “The Perpetual Emigrating Fund,” Millennial Star, 26 November 1853, 777-779. 3 England. 1851 census. Middlesex, St. Pancras, Camden Town. 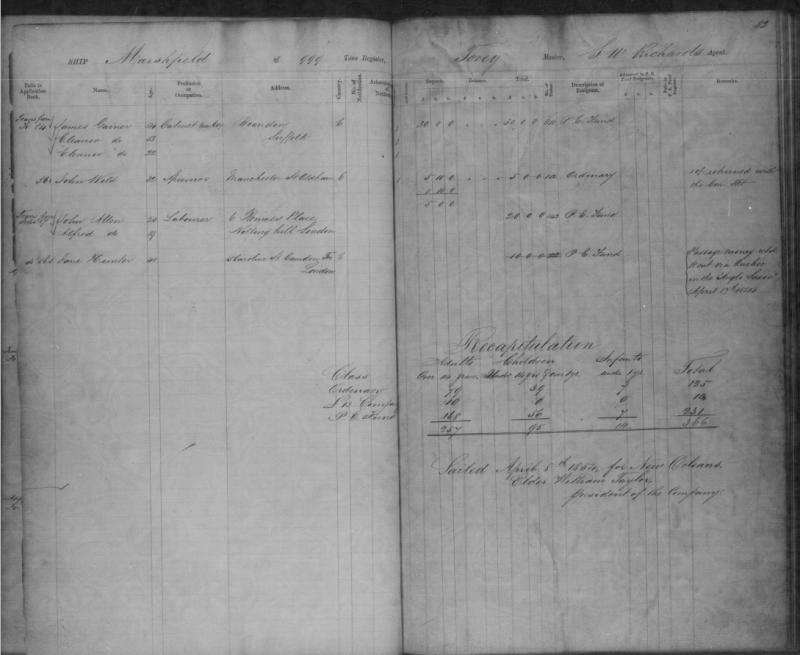 Jane’s address in this census, and her address on the European Mission emigration records, are literally around the corner from each other; even though the English census does not indicate race, the age and residence of this woman in the census match Church records, and nothing on the census contradicts anything known about Jane in Church records. It seems highly probable that this census record does pertain to the same woman who appears in Church records. 4 Thomas F. Fisher. Journal, entries for 31 March - 5 April 1854. MS 12,594, Church of Jesus Christ of Latter-day Saints, Church History Library, Salt Lake City, Utah. 5 Church of Jesus Christ of Latter-day Saints. European Mission. Emigration Record. CR 271/25, vol. 2, folios 67, 82, 86. The dating here is somewhat problematical. An eyewitness, Thomas F. Fisher, places Jane aboard the Marshfield for the medical examination on 5 April; other records say the Germanicus sailed on 4 April. The accounting records of the European Mission record an entry for Jane on the Marshfield, with a notation that the record had been transferred to a page for the Germanicus in the ledger book, with a further note that her record had been transferred back to the Marshfield’s pages. It may be that the emigration clerk expected the Germanicus to be delayed, as the Marshfield had repeatedly been. 6 Church of Jesus Christ of Latter-day Saints. European Mission. Emigration Record. CR 271/25, vol. 2, folios 67, 82, 86. “Emigration Report,” Millennial Star, 13 May 1854, 297. The Anglo-Saxon was a brand-new sailing vessel; it is likely that Jane sailed on that ship’s maiden voyage. “Over the Waves: SS Anglo Saxon,” Original Shipster [blog], 29 November 2015.